Removes bloated metadata. Saves disk space & bandwidth by compressing images without losing quality. These instructions are only for the Mac version of ImageOptim. See version for your system. Download ImageOptim archive — it should download within seconds. 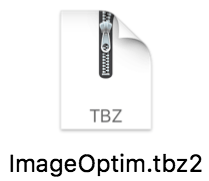 Open the downloaded archive (double-click the ImageOptim.tbz2 file after it finishes downloading) — it will reveal ImageOptim.app. Then drag the ImageOptim.app icon to Applications, and open it from there. 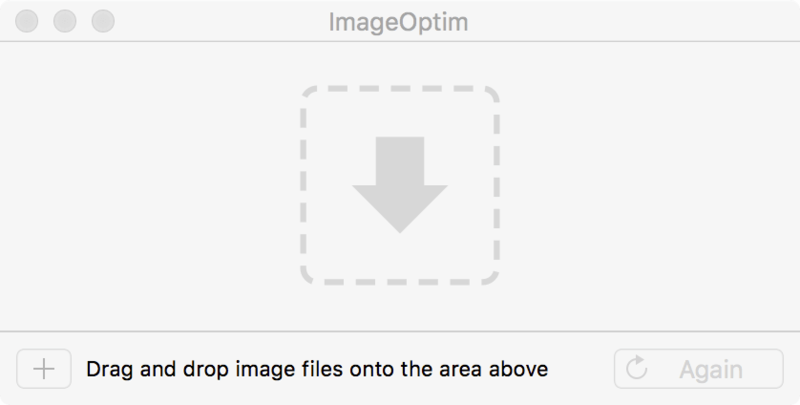 After launching ImageOptim.app, drag'n'drop images into its window (if drag'n'drop is not convenient for you, you can press the [+] button in the bottom-left corner instead). Files are saved automatically. There are no new files generated — the files you drop are optimized in-place. ImageOptim overwrites the files with their optimized versions. This is safe, because ImageOptim preserves image quality. If you're not comfortable with that, you can create copies of the files before dropping them into ImageOptim. Also, as a precaution, ImageOptim puts original files in the Trash, so you can easly restore them if you ever need to. Depending on the number and sizes of the files it can take a few seconds or even minutes to process them. = working, please wait (if it takes too long, you can select the file and choose menu File › Stop). = the file is optimal already, so it hasn't been changed. That's normal if you've run ImageOptim on this file before. = Success! The file has been optimized and saved. Note that optimizations apply to a particular file. If you change the optimized file (e.g. edit the image or resize it) then you'll need to optimize it again. By default ImageOptim removes invisible metadata from images, such as EXIF camera information and color profile. Metadata makes files larger. If you're publishing images on the Web, it's best to remove all metadata, because browsers either don't make use of it, or support it poorly. Currently, ImageOptim doesn't have option to only remove some types of metadata — it's all or nothing. Created by Kornel Lesiński. Contact. Follow on Twitter.